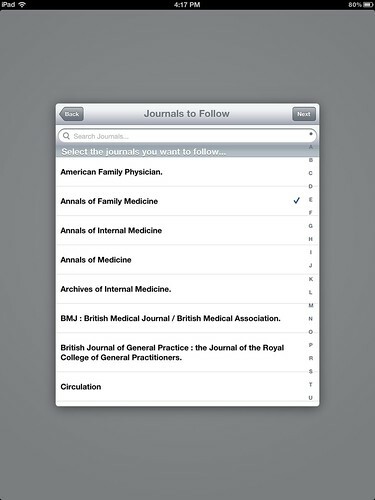 This morning I posted on iMedicalApps.com the article, “Don’t have an iPad, go to the medical library and borrow one.” There are lots of medical libraries loaning iPads out to their patrons and this post was a way to highlight to physicians some of the ways libraries are helping them get connected using iPads. In my research I discovered that there are A LOT of medical libraries doing this, too many to list in the actual article. So in order to have a more comprehensive list of libraries loaning iPads I thought it would be a good idea to create a comprehensive list of libraries who loan them and post it on the iMedicalApps forum. 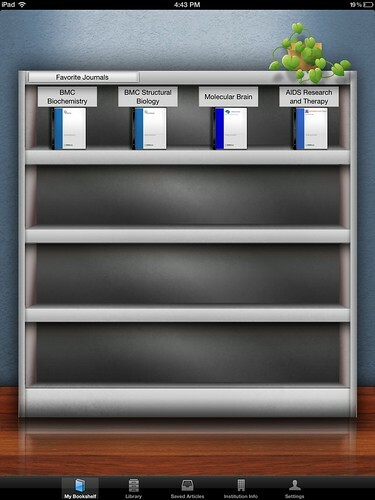 So if you library loans iPads, list it on the forum with your basic rules and some of the popular apps loaded. Remember keep it short and sweet with not to much library geek jargon, we want it to be easy for docs and medical professionals to scan through and look at it. Interested in the geeky library details? 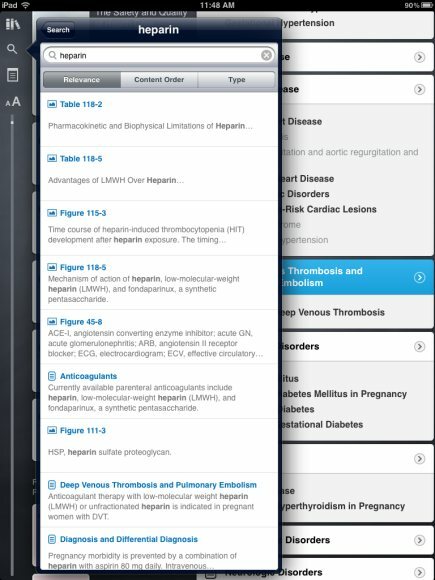 Don’t worry, I will posting in the next few days the librarian version of the iMedicalApps article. This will have the information that librarians interested in starting their own iPad loaning project will want to know about. The iMedicalApps team compared Harrison’s Principles of Internal Medicine on Inkling vs. AccessMedicine. I feel I am at a bit of a conflict of interest here. I have recently begun to work with iMedicalApps to write some posts (I am currently working on a post right now) and I agreed to moderate the Medical Librarian’s Corner of their Medical Apps Forum. My problem is that I see at least one error in the review, another area where the author needed to be clearer in their evaluation, omissions regarding updates, and a slight bias toward student use. As a result it makes it difficult for me to read the comparison without talking back to the computer. 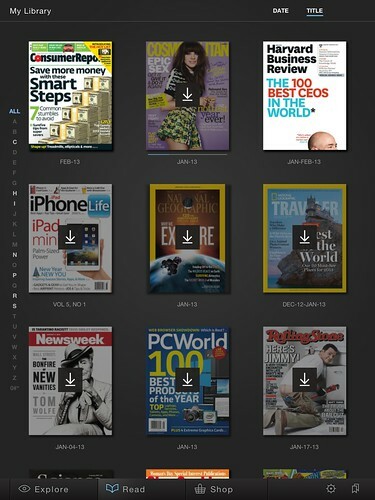 Now I don’t have an iPad (saving up for an iPad 3 when they come out) and I don’t have a subscription to Inkling, but I have worked with Harrison’s Online through AccessMedicine extensively so I am extremely familiar with it. Since I don’t have Inkling’s Harrion’s I can’t do a comparison of the two products, but I feel the need to point out the error in the review and provide some criticisms about the review itself. While I may be struggling with how to do this appropriately given my new relationship with iMedicalApps, I don’t have any conflict of interest with AccessMedicine, McGraw Hill or any of the Access databases. In fact I have recently been kind of critical of them for having difficult mobile access policies (require personal login even while on campus) that do more to hinder the use of their ebooks. Update 2/22/12 Ooops…I am wrong, I do have a conflict of interest with McGraw Hill that I should report. I am on the Library Board for Silverchair and Silverchair actually built McGraw Hill’s AccessMedicine product. I want to thank those who reminded me of that. It was never my intention to hide that information, I just was more focused on the actual product and the review and honestly forgot about Silverchair’s involvement. So I guess with ties to iMedicalApps and AccessMedicine, you could say I am equally(?) conflicted? Despite the various possible conflicts of interest, I really just tried to expand on the orginal review of the two platforms and correct an error. First, let me address the obvious error within the review. 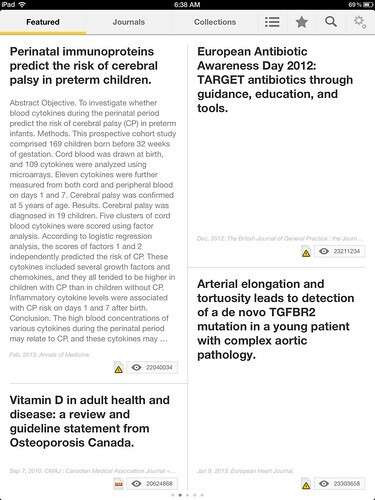 The author of the review compared the search features of the Inkling platform and the AccessMedicine platform. This is incorrect. 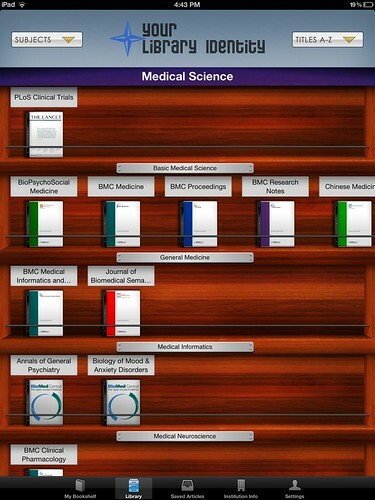 AccessMedicine’s Harrison’s can search only within the book. The author of this review failed to notice the drop down arrow next to the search box that allows one to search only within Harrison’s. See image below. This a pretty obvious error. Now I admit the default for the search box is AccessMedcine (as you can see) but just clicking the arrow you can easily limit your search to Harrison’s. 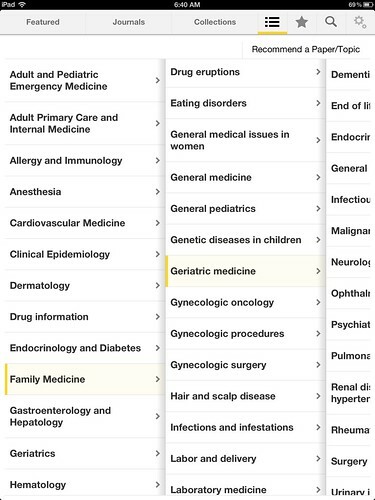 Perhaps AccessMedcine might want to consider making the default for the Search dependent on where the user is on the site. If the user is within Harrison’s then the default is Harrison’s. If the user is in Goodman and Gilman’s then the default is Goodman and Gilman’s. If this is possible, this would help people out. 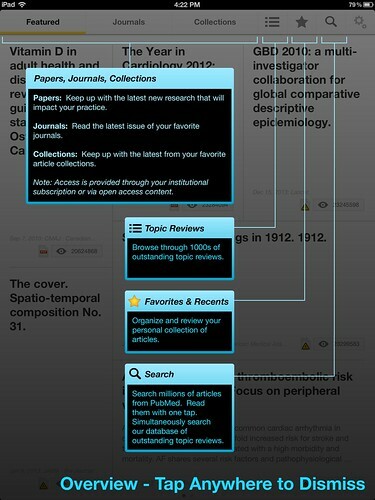 Second, I feel the reviewer needs to be a little clearer regarding the search results within Inkling and AccessMedicine. The reviewer takes issue with the number of times the term heparin was found within AccessMedicine’s Harrison’s vs Inkling. “Moreover, the power of the Inkling search is greater than AM’s. I retrieved 50 matches when I searched Heparin on Inkling. In AM, I only retrieved 13 matches, most of which were tables, rather than mentions of heparin within text chapters. Harrison’s is such a mammoth text that a powerful search function is essential, which Inkling provides and AM does not. This statement implies that the reviewer only looked at the search results screen from Harrison’s and counted on the number of retrieved results. They are correct that most of the retrieved results were tables where heparin was mentioned, and only one result was where heparin was mentioned within the text of Harrison’s. However, this is kind of misleading. This implies that the term heparin was only mention once in the entire book of Harrison’s on AccessMedicine, which is not the case. 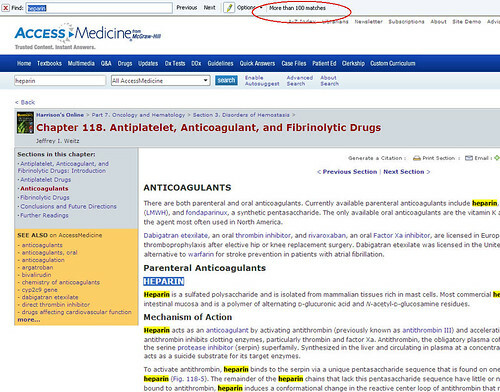 When you do a search for heparin in AccessMedicine’s Harrison’s, the top result (see image below) is a whole chapter on antiplatelets and anticoagulants (Chapter 118). 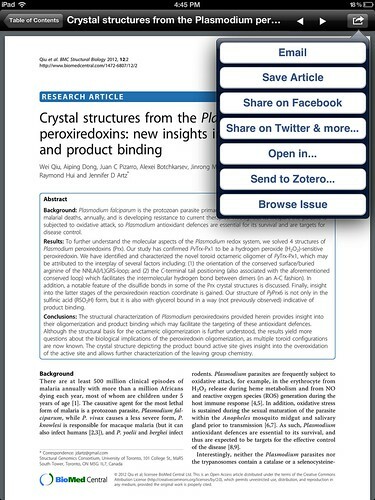 Yet in the reviewers own screen shots, a search on heparin in Inkling also lists mostly tables AND the most relevant information (the chapter that heparin is mentioned) is listed far down on the retrieved results. I would have thought the chapter is more relevant than the tables (and given the tone of the review, so does the reviewer) but it would seem from the Inkling screen shots that it isn’t because listing for the chapter burried below the results for tables. So my question for the reviewer is whether Inkling retrieved more hits because it was counting the multiple times the term heparin was mentioned in the chapter on anticoagulants OR did it find more instances of the term heparin within OTHER chapters of Harrison’s. This is kind of an important nuance when you are looking at search results. Because if Inkling’s 50 hits were all within the same anticoagulant chapter then the search feature is similar to AccessMedicine’s and the results are just presented differently. (Here is a whole chapter on heparin vs. here is where it is mentioned every single time in the chapter.) 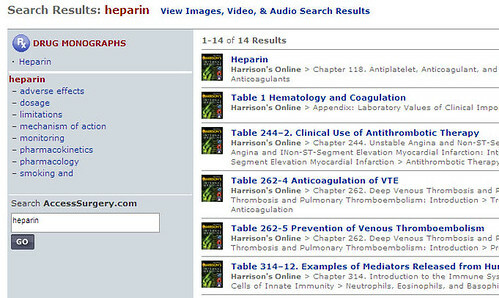 But if Inking’s search found more instances of the term heparin within other chapters of the whole book then the search features on Inkling are picking up something that AccessMedicine isn’t. Is this good or bad? It really depends. Is it picking up relevant results like the paragraph on heparin in Chapter 370 Cerebrovascular Diseases (ischemic stroke section) or is it just picking up the term where it is used briefly in a sentence and really has little relevance if you truly searching the subject heparin? It is also important to remember that Inkling’s results for heparin were not as relevant because the chapter was listed the tables. When looking at the strength of search engines more than a mere word count needs to be discussed if we are to really understand which platform has the best search features. Relevancy is way more important than sheer number of results, look how much junk floats to the surface of some Google searches. Unfortunately this was not discussed in detail enough for us to determine whether Inkling’s search engine is really better (retrieves more relevant results). The reviewer does correctly mention that AccessMedicine has the most updated information from Harrison’s. Updates are made continuously online through AccessMedicine, therefore a reader doesn’t have to wait for a new printing of the book. “It is uncertain whether Inkling will enable the same kind of updates.” The reviewer surmises that Inkling will update their version when the next edition of Harrison’s is available (much like a print edition schedule). However, the reviewer omitted to discuss the e-chapters within AccessMedicine’s Harrisons and whether they were available on Inkling. 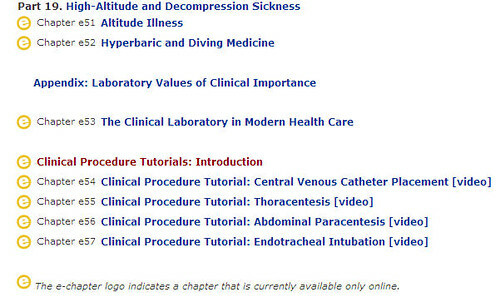 There are over 50 e-chapters that according to AccessMedicine are only available online (image below just captures the last chapters with the note about the e-chapter logo). It is imporant to know whether Inkling’s text has these same chapters as AccessMedicine or whether it is missing chapters. Finally, the reviewer seems to have a slight bias toward student use. The reviewer seems to dismiss the charts, tables, and PowerPoint lecture slides. Maybe some students may not care about slides, figures, and PowerPoint slides, but if you have to give a presentation you probably care a lot. As a librarian at a large research medical center I can tell you this type of “ancillary material” is asked for and used more than the reviewer would think. 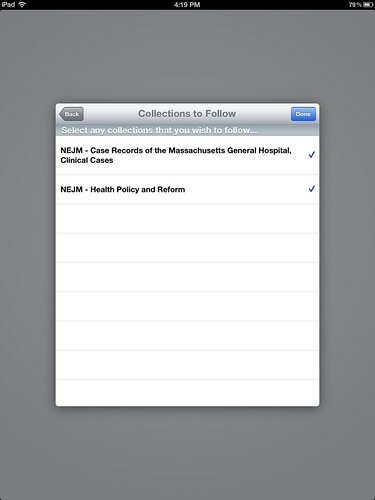 For example I can’t tell you how many times I used to get asked about NEJM’s PowerPoint slides and how they could download them. (I am not unique, other librarians have been asked this too.) So I would say that Harrison’s slides, charts and tables are more than just mere ancillary material that only instructors may care about. I think if you are doing any research, publishing, and presenting you will be very happy to have another resource for your papers and presentations. Now that I have pointed out the things I found to be lacking in the review, I do want to mention some of things that I feel the reviewer correctly hit on. 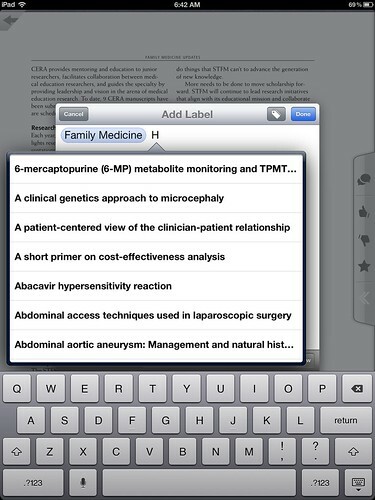 Note taking within AccessMedicine’s Harrison’s is not helpful and all types of users, including students, take notes. 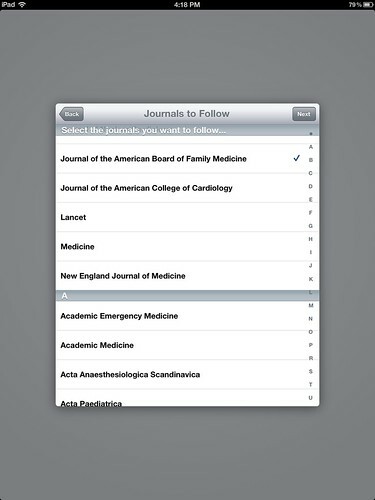 If you have created your own personal MyAccessMedcine account you can “Bookmark” chapters and items, but you really can’t take notes. The reviewer is also correct that if you want a version of Harrison’s that is not dependent on an Internet connection then Inkling is for you. However, as hospital networks improve I see this locally loaded feature (of any product not just Inkling) to be less of an issue. The cloud is the future for information storage and retrieval. But I do recognize this is a personal taste issue, some people just like having content loaded locally. 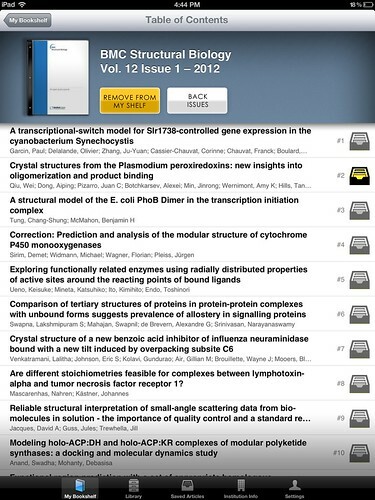 The way AccessMedicine limits readers to view only sections at a time is frustrating and a barrier. 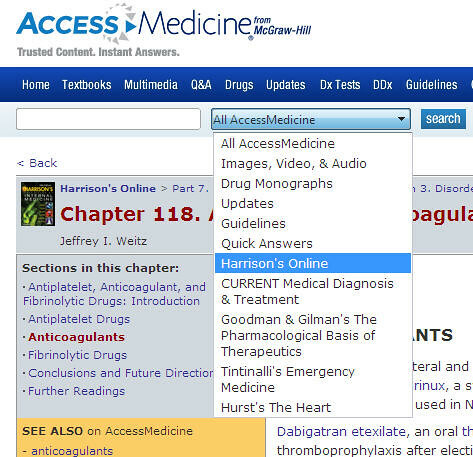 As a result AccessMedicine’s Harrison’s Online is not an easy book to read online. Inkling’s version appears to be very easy to read online based ont he review. The reviewer correctly mentioned the reason for divvying up the book into sections was to prevent online piracy. Unfortunatly, this does little to prevent piracy and more to inhibit real usage. (People are scanning entire books and making them available online. 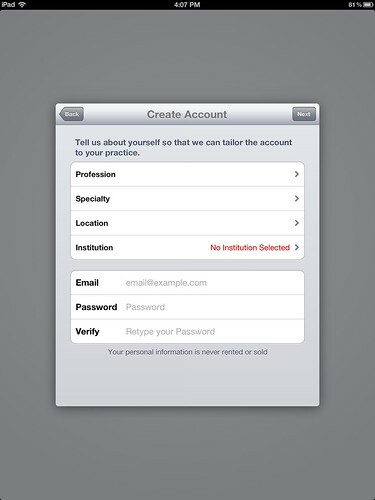 AccessMedicine does little to prevent guests from creating a MyAccessMedicine password at a subscribing institution and using it well after they are an authorized user.) It appears from the review, Inkling’s book is much more user friendly to read in a sitting rather than the AccessMedicine version. AccessMedicine’s presentation is limits its use. Personally, I think the decision to use AccessMedicine’s Harrison’s vs Inkling breaks down into 2 parts. 1. If you want to stay current and have the most recent information then you need to use AccessMedicine’s version. Inkling has not indicated their update schedule and AccessMedicine always updates Harrison’s. The reviewer did not mention if e-chapters are in Inkling’s version, if they aren’t then you are missing chapters. 2. If you are not as concerned about the timeliness of the information (or the possiblity of missing e-chapters) and you want an easy to read experience with the ability to take notes and read offline then Inkling’s version is what you want. I saw this article, “Hospitals slow on tablet implementation,” last week and posted it right away on my Facebook account with the intention of blogging about it the next day. Sigh… that was before round two (or is it three now) of sick kids. Wow, Apple’s Tim Cook was a little off on his estimate that 80% of top hospitals were testing the iPad. Ok, looks like my hospital and I are not in the minority as it sometimes felt. But after those thoughts and others left I began to wonder what is the real hold up. It can’t be that 99% of all hospitals have the same draconian IT policies. (Although my conspiracy theory friends might disagree.) Why does it seem that U.S. hospital have such wonderful advance cutting edge technologies for diagnosing and treating diseases, but when it comes to computer infrastructure, hospitals cannot keep up with technology. So I began to look around the web to find out if anybody commented on Sarah Jackson’s post at Fierce Mobile Healthcare as to why so few hospital have done fully functional tablet systems. Both Jenny Gold of Kaiser Health News and iMedicalApps approach the problem from the app side of things. Gold’s article blames the EMR companies that often don’t have apps for their software, thereby forcing hospitals to use third party apps like Citrix or VMware which can be clunky and slow. Satish Misra at iMedicalApps points out that even apps created by EMR companies like Epic, Centricity, and Allscripts require make their EMR apps read only making it a necessity for doctors to log on to a separate computer to make notes in the chart. To add to the “fun” many of these EMR companies like Epic and Allscripts require separate licensing for their mobile platforms. (Hmm that little caveat sounds familiar to librarians.) So what you have is all these hospitals who have spend LOTS of time and money getting themselves and EMR product and now enters a game changing product that was never envisioned 5 years ago when many hospitals were well into their EMR planning and implementation. While EMR integration is important there are many doctors who are using the iPad without that ability. They are using them in the exam room, ER, Surgery, and especially in radiology. According to Robert McMillan of Wired, Apple has a secret plan to steal your doctor’s heart. His name is Afshad Mistri. (Although I am not sure how secret he can be when Wired does a big article on him and he is organizing invitation only conferences for medical professionals.) His goal (and Apple’s) is to get the iPad in the hands doctors. McMillan reports that it was Mistri who launched the special iTunes room for healthcare in September, and promoted it to a select group of healthcare app developers. Apple has to be careful promoting the iPad in hospitals. Step too far one way and the FDA will want to regulate it as a medical device, but don’t step at all and you don’t get it in the hands of doctors. The Wired article is a very interesting read and highly recommend it because it does a good job of illustrating just how Apple, a consumer oriented company not a company usually interested in businesses, is delicately trying to work its way into healthcare, specifically hospitals. Just from a quick look through the Internet it seems that there is a host of reasons why 99% of the hospitals don’t have fully functional tablet systems. But from my perspective it seems to basically comes down to money (doesn’t everything). It takes some serious cash to license the app (3rd party or from the EMR company), some apps aren’t even fully functional so you aren’t saving on hardware costs by chucking the PCs. It also costs a lot of money to support the product and write hospital specific apps. Additionally they have to spend money on the infrastructure, making dead zones viable. If something wasn’t put in the budget and it is that costly to implement, it is going to take quite a while (years maybe?) to implement. The iPad is less than 2 years old. It wasn’t even a glimmer in budget lines back then. The speed of personal day to day technology has outpaced hospital budget planning processes. Quite simply, hospitals are giant cruise ships that can’t turn on a dime when the iceberg of new technology comes into sight. Let’s just hope most hospitals are not the Titanic.